Colorful cutlery - Set your table with this exclusive and colorful 24 piece Laguiole tableware set. - Foster traditional table culture in modern beautiful design with these hand crafted genuine Laguiole products from the French cutlery manufacturer Claude Dozorme at Thiers. Forged from one piece of top quality steel and shiny polished, for highest comfort with exceptional surface feel and visual appearance. - Of course all parts are purfled with the bee as the typical Laguiole design element. - A pleasure for all senses. 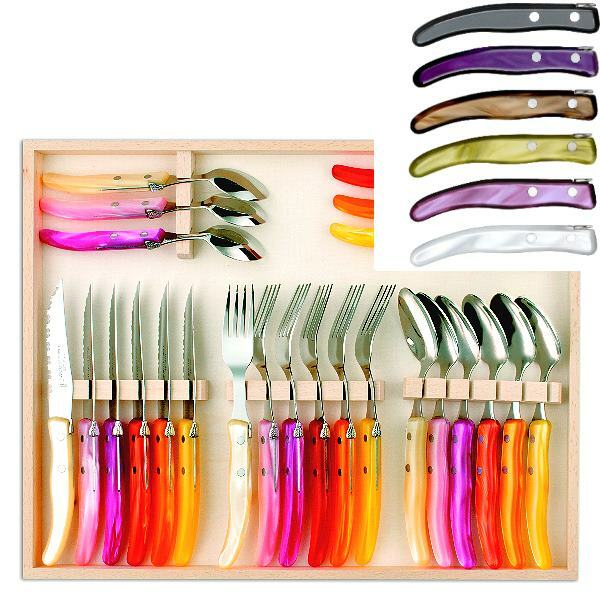 - Laguiole Berlingot Cutlery Set of 24 in Box, Gris-Violet, 6 steak knives, forks, spoons, 23 cm, 6 coffee spoons 17,5 cm, handles Gris, Oilve, Cappuccino, Violett, Lilac, Blanc.